Despite any misgivings I may have had about the film (Brief Encounter), the actual visitor centre is a triumph. The tea rooms have been recreated to match the one featured in the film, complete with a steaming hot water geyser, period counter and very forties furniture. You can take a sneak peak at the station master's office used by Celia on cold nights between takes, where she was fortified by the odd brandy and convivial company of the true stationmaster. There is also the obligatory gift shop, stuffed with Brief Encounter memorabilia from postcards to posters. The efforts of the volunteers has given new life to what was once a derelict and forgotten piece of cinema history. A long awaited new travel book from John Brown (remember Return to Oz?) which explodes the myths held by many about the North. From the lush plains of Cheshire to the Yorkshire Dales and Northumberland, from Hadrian's Wall to Cumbria, Lancashire and Merseyside – John Brown skillfully picks away at the widely-held belief that all people 'North of Watford Gap' live in terraced houses, keep whippets and pigeons, and wear flat caps and clogs. 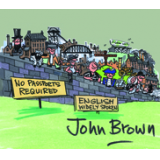 In this lighthearted romp across the northern counties of the UK, John compares the history of its major cities and their place in modern day Britain. Always well researched and informative, he cleverly unpicks the myths and sets out the true nature of each place he visits. Inbetween the more known places, John sprinkles the pages with odd landmarks, places of interest and anecdotes galore. In short, he has once again mastered the art of carrying the reader with him, and as with all of John's writing, there is always a healthy dose of humour or irony, making the reading experience simply a joy.